We have 1 openings in the GA Pre-K program for the current school year. Registration for 2019-2020 school year begins on March 1st. Brookwood Learning Center has been serving Paulding County for over 30 years, offering quality, affordable child care for children ages from birth to age twelve. We are excited to offer private kindergarten program for the 2018-2019 school year. Our goal is to expand and offer all elementary grades in the coming years. We provide a supportive environment in which both the parent and child may benefit. Trained early childhood educators, working together with the parents, offer a program of activities designed to aid in the physical, cognitive, emotional and social development of our students. Our hours of operation are 6:00am through 6:30pm Monday through Friday. Please review our other pages regarding our professional services to meet your children's developmental needs. 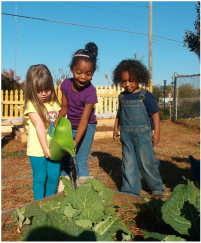 We do Organic Gardening with kids.